Bath time isn't only a time to wash, for children it's a time to play! Bath toys, bubbles, and splashing are among the favorite bath time activities for most young children! Sometimes the most educational toys are also the simplest toys -- toys with lots of open-ended possibilities that encourage young minds to think, to create and to explore. The best of these toys provide progressive layers of challenge for children to discover as they grow. At their very best, these toys encourage exploration, reward discovery and empower our children. 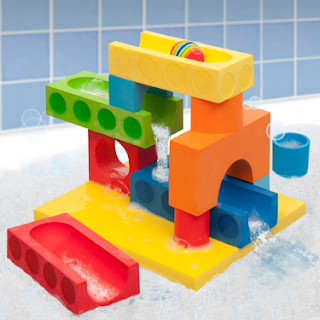 BathBlocks bring classic block play into a fun, new, fascinating watery environment. The bathtub is the perfect place to create water slides, ball runs, floating towns and more. The “sticky” viscosity of water creates a helpful cling between blocks, and the movement, buoyancy and flow of water add an engaging twist to classic block play. I love that BathBlocks are colorful, soft, easy to hold for little hands, and most of all, the fact that they create hours of creative play. Children will not only have fun playing with these bath toys, they will also be able to use their imagination and creativity and learn the value of cause and effect. 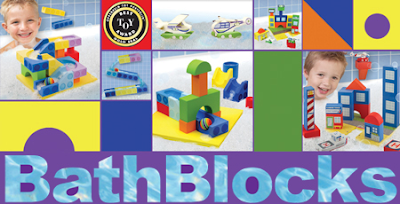 BathBlocks empower children to create their vision as they experiment with geometry, addition, subtraction, multiplication, division, balance, structure and cause-effect. BathBlocks stack like blocks, stick like magnets when wet, cling to most wall when wet, are easy to start, fun to play with and explore and the possibilities are infinite. BathBlocks cling to flat, smooth, non-porous walls and surfaces like polished tile, fiberglass, polished granite, porcelain, etc. BathBlocks have won Oppenheim Gold awards. BathBlocks are made from bacteria and mildew resistant EVA and contain no PVC or phthalates. 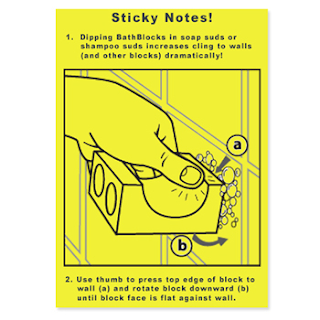 *Special Note: Dipping BathBlocks in soap or shampoo suds increases their stick to tub walls and other blocks dramatically! This giveaway will end November 11th at Midnight EST. Disclaimer: The Being Frugal and Making it Work family received a complimentary Big Blocks water fall set. All opinions are based purely by our own experiences. No monetary compensation was received. Results may vary. My daughter would love the 20 pc Floating Castle Set. Bath time is her favorite time of the day and the only bath toys she has right now are a set of ducks and a set of stacking cups. This is something she would love to play with EVERY day, which isn't something I can say about the majority of her toys! I think the BathBlocks Seaport Set would make a great gift for my boys. I love the 20 pc Coast Guard Set in Reusable Storage Bag. Great fun for the bath! The helicopter is cool so I would have to pick 20 pc Coast Guard Set. The 20 pc Coast Guard Set in Reusable Storage Bag looks like one my nephew would have lots of fun with. 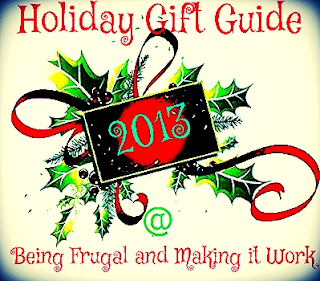 I think the Coast Guard & Helicopter (22091) would make a great gift. Thanks for having this giveaway. The Coast Guard and Space sets look fun! I also like the 20 pc Floating Castle Set. My five year old would love the "20 pc Coast Guard Set in Reusable Storage Bag". These would be great because my kid always want to take our normal blocks in the tub, I'm not a fan of that. I think the BathBlocks Seaport Set would make a good present for my son. Floating Cook Set (23010). But really any new toy for the bath they love! I think my boys would really like the 20 pc Coast Guard Set in Reusable Storage Bag. Would make a great christmas present. The coast guard and helicopter set is cute too! My boys would love the Coast Guard & Helicopter set. They could build floating piers, bridges, towers and more in the bath. I know my son would like the 20 pc Coast Guard Set in Reusable Storage Bag. He would love the colors of the blocks. My son would love to play with the Coast Guard and Helicopter set. He loves all things that fly and would have a blast with it. 13 pc Seaport Set in Reusable Storage Bag! So cute and he would just go nuts over the helicopters with it! So fun!!! The 20 pc Coast Guard Set in Reusable Storage Bag would make a great gift. My son would have a blast playing with it. My son would enjoy the 21 pc Ball Run in Reusable Storage Bag. He would spend hours in the tub or even in his water table which is set up out side in the warmer weather.